This year, university and post-graduate students are offered exciting opportunities for higher education abroad. From January thru March, the British Council opens its doors to higher education in the United Kingdom through Education UK. The campaign highlights Education UK’s message of “Your Future on Track” and provides interested Filipinos a venue to explore educational possibilities in the United Kingdom. For the first quarter of 2010, three (3) key activities will be held in support of British Council’s Education UK, namely: (1) an Alumni Counselling Session, (2) Funding Options Seminar, and (3) the Education UK Exhibition. The various activities taking place at each event are designed to arm visitors with the necessary information they would need from gathering information on UK schools to application and visa preparation. 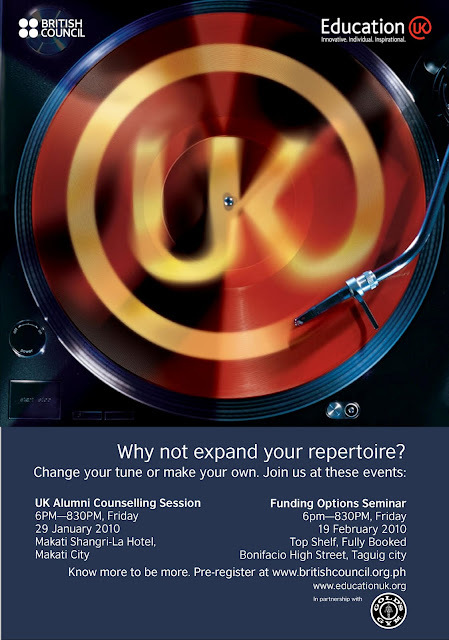 The first of a series of Education UK events is the Alumni Counselling Session taking place at the Makati Shangri-la on January 29, 2010. The Alumni Education Exhibition will showcase alumni from the top universities in the UK, including Oxford University and Cambridge University. Each alumnus will talk about the schools they attended and their experiences as students to give interested parties a chance to glean insider information about what life in the United Kingdom is truly like. Following the Exhibit is a Funding Options Seminar on February 19, 2010 at Top Shelf, Fully Booked in Bonifacio High Street. The Seminar is slated to cover financial possibilities and scholarships for interested students. The culmination of the Education UK Campaign is the Education UK Exhibition on March 5-6, 2010. Taking place at the ballroom of the EDSA Shangri-la Hotel, representatives from UK universities will be in attendance to speak directly to students about the schools they represent and specific courses available. An education system that is at least 800 years old, and still in the fore front of modernisation. Cambridge University is considered one of the oldest education institutions in the UK (the other is Oxford University) and it is one of the fore runners in Molecular Biology (DNA manipulation and cloning). Universities are home to the most modern facilities in the world. UK degrees are recognised globally and regarded as prestigious and of high standards. Specific courses that cater to your individual career needs and aspirations. Choose from over a thousand courses! Example: Earn a masters degree in F1 engineering or clay pottery. Example: Lesley Mobo graduated with MA in Women’s wear from Central St Martin, University of Arts London and now is the senior designer for Jasmine de Milo of Harrod’s. - Gathers Top UK universities for a counselling session. The Alumni will counsel students allowing a more accessible venue for aspiring Filipino students who want to have a prestigious UK Degree. This is a venue to get first hand information on how to apply, survive, live through and benefit from a UK education. 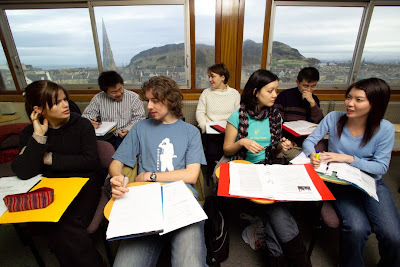 - Scholarship given by the Foreign and Commonwealth Office and administered by the British Council. - A briefing session given to departing students and professionals. Covers topics from culture, food, lifestyle, transportation, climate, etc. - British Council visits at least 10 high schools and universities in the Philippines to promote education in the UK. - Seminars of different topics will be held all throughout the year to give more information to aspiring students on how to go about their programme of choice. Resource speakers are graduates of these programmes. Topics include: MBA and Finance in the UK, Law in the UK, Scholarships and Funding Options, etc. 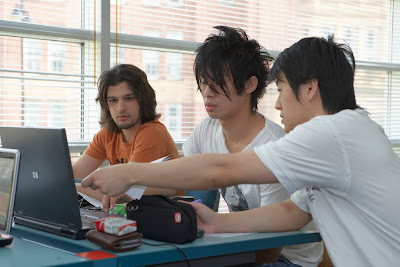 - The premier service offered by the British Council and the alumni. Free of charge, this aims to help the aspiring student in the decision making process, briefing, etc. - The annual education exhibition of the British Council brings together official representatives form UK institutions. This allows students to speak directly to them about courses, application procedures, fees, etc. Admission to all events is FREE. For more information, log on to www.britishcouncil.org.ph.